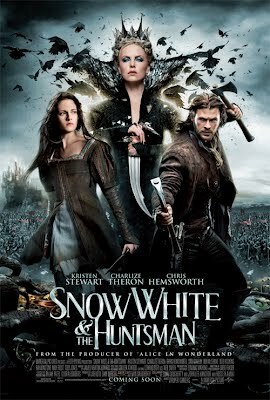 Synopsis: “In the epic action-adventure Snow White and the Huntsman, Kristen Stewart (Twilight) plays the only person in the land fairer than the evil queen (Oscar® winner Charlize Theron) who is out to destroy her. But what the wicked ruler never imagined is that the young woman threatening her reign has been training in the art of war with a huntsman (Chris Hemsworth, Thor) who was dispatched to kill her. Sam Claflin (Pirates of the Caribbean: On Stranger Tides) joins the cast as the prince long enchanted by Snow White’s beauty and power. The breathtaking new vision of the legendary tale is from Joe Roth, the producer of Alice in Wonderland, producer Sam Mercer (The Sixth Sense) and acclaimed commercial director and state-of-the-art visualist Rupert Sanders” (United International Pictures). Verdict: The acting of the two lead actresses (Kristen Stewart & Charlize Theron) is very convincing, the visual effects are good and the cinematography suits the tone of the film but the plot holes, the many unintentionally hilarious scenes, the uneven story flow, and the lack of development for the huntsman character (Chris Helmsworth) have contradicted the concept of this darker and less fairy tale-ish reimagination. 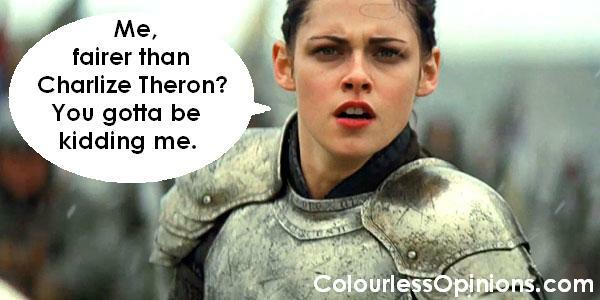 Having Snow White to put on an armour and lead an army is just as dumb as how Tim Burton had Alice fighting a dragon. However, despite all that, Snow White & the Huntsman is still way more watchable and respectable than the other recently released Snow White film, Mirror Mirror (2012). Second opinion: “Too many parts to make fun of” (Iris Loong). Malaysian censorship: The official length of the film is 127 minutes but the running time stated on the local cinema websites is only 110 minutes. No idea what is cut, if any at all. Major plot hole: Snow White is held captive in a dirty cell by the Queen since she was a little girl but somehow, she manages to grow up pretty, smart, mature, and athletic. She is imprisoned in the small cell for approximately more than half of her life and yet she manages to strike, run, jump and slide to escape from the castle as soon as she finds a huge nail to be used as weapon. That means without even planning beforehand! I’d be pissed off as well if I was the Queen. And then at the end, without going for any training at all, she wears an armour, carries a sword and shield, and leads an army to war and defeats the Queen who supposedly has powerful spells and a large dark army. What is she, an angel or a man in disguise with natural war and leadership talent? Most ridiculous scene: Snow White walks around the Forest of Fairies (or whatever it’s called) with all the little creatures following along. She finds a white deer and approaches it for what should have been a magical and defining moment for the protagonist while the dwarfs talk about how she is “life itself” but right after that’s said, the white deer gets shot by an arrow. The mirror: The film has parts where they explain how everything and every character came about but fails to mention what is the magic mirror and where did it come from. It takes very long for it to respond the queen’s usual question because a whole liquid-like human figure has to come out of the mirror first. The weird thing is that when she is shown to ask the question the second time, the mirror figure is already standing right in front of her. Does that still consider it being “on the wall”? Total fail. Oh? So Snow White escaped the jaws of the wolf and fell into the arms of the huntsman? LOL!!! What's with the sudden interest in Snow White – re. Mirror, Mirror? P.S. Thanks for dropping by my blog. Do come again, I've linked you in my blogroll. Charlize Theron and Kristen Stewart did very well especially Charlize Theron and yes, I still can't get why she got to be jealous of Kristen. However, the last scene, Kristen Stewart seems like being uncomfortable than happy. Just isn't the right expression I was anticipating. The story is a bit draggy due to many useless scenes which doesn't connect much. I will leave out the details to avoid spoilers. that includes the mirror. And I still don't get why they did not kill her when she's young. Why need to keep her when they are not even aware of the purpose of keeping her. Somehow, I felt the producer wanted to avoid being too much like Snow White. Even her name wasn't mentioned or called in majority of the movie. @EricLee There are just too many flaws and unnecessary scenes that don't tally but I didn't notice difference of hair colour. But all these mistakes can be considered minor with the major plot hole I mentioned. [SPOILER]The Queen kept Snow White 'cause she probably wanted to consume her youth or beauty (or whatever) when she grows old enough like the others. Her brother might have been feeding her good food since he secretly likes her. What I didn't get was why they didn't kill Greta after her youth was consumed. the essence of Snow White has been lost the moment she wore and armor to lead an army. hahha i agree with that expression…but somehow, it's also like an expression of hiding an incoming massive diarrhoea..
@Fish They have 8 dwarves instead of 7 on this film.